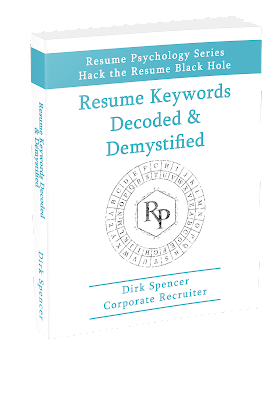 The new book is Resume Keywords Decoded & Demystified. Resume Keywords Decoded & Demystified was based on a suggestion for an on online class by a friend. From my point of view, with 2 books on resumes, I was confident this topic was well covered. It seemed like there was enough information with examples and honestly resume keywords seemed obvious. My friend’s reply was immediate and direct: “it seems obvious to you because you work with this writing books and reviewing resumes all day.” Which pushed me off my pedestal and it made me listen. The claim, career professionals, did not know how to start, where to look or what to do regarding their resume keywords. People with 10, 20-year careers across 1 or 2 major companies, people making decent money. This meant there was a good chance there are people with less awareness not willing to vocalize their need for help, too. Regardless, one truth exists, there is room for better, more detailed information on resume keywords. This book is an attempt to provide the missing help. My approach for the book is super-newbie, baby step walk-thru with real-life examples. The goal: to make you the master of your resume keyword needs by teaching you the “what-to-do” and “how-to-do-it” for your exact situation. While the guts of this book originate from the online class and webinar trial, it contains more details. I have added my consulting questions. These questions are designed to guide you as if we were working together. These are the questions used during my paid one-on-one and group resume coaching. This means you are not going it alone. Using these extra questions should help you organize and prioritize your resume content with confidence. 4. Why Do You Need Resume Keywords? 7. Where Are Your Resume Keywords? 17. Will this get me hired? 18. How Many Resume Keyword Sources is Enough? 20. When Do You Stop? 24. How Many Resume Keywords Do You Need?